It’s been a very exciting week for me, and not just because I am writing this in between thunderstorms while doing field work up in the beautiful Genting Highlands of Malaysia. The results of the Marsden Fund were announced this week in New Zealand and one of the successful projects was one that I was involved in writing, with Greg Holwell as PI, on the evolution of animal weaponry. The best part is that there will be a postdoctoral position available for me back at the University of Auckland next year. It has been a really fun year so far in Singapore, but it hasn’t been so easy for my husband to find work and he is keen to head back to NZ to return to his job there. As any early career scientist can understand, it is hard to find a balance between getting research experience abroad and staying close to partners and family. We made a choice early on to stick together and had recently decided to move back to NZ once my first year at NUS was up, despite not being sure what 2016 would have in store for me professionally. With all this in mind, the timing of our success in the Marsden fund couldn’t be more perfect! 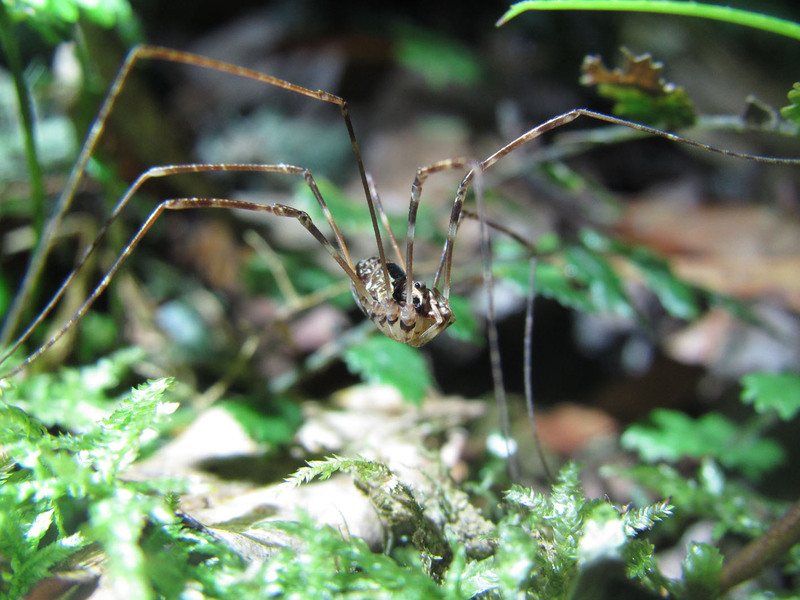 Our project aims to understand more about why weapons are so diverse in animals and will be focused on a fantastic group of invertebrates: the long-legged harvestmen (Opiliones: Neopilionidae) of New Zealand. These curious looking arachnids are found throughout the wet forests of NZ, usually hanging out on mossy tree trunks, on the underside of fallen trees, or in caves. Harvestmen are a type of arachnid, and are often mistakenly identified as a spider, but are actually more closely related to scorpions. Harvestmen can be distinguished from spiders in that their bodies look to be made up of just a single oval-shaped structure, due to the broad fusion between their cephalothorax and abdomen. Spiders on the other hand have a distinctive constriction between their cephalothorax and abdomen. If you want to look really closely you will also notice that harvestmen have just a single pair of tiny eyes on the middle top surface of their body, while spiders have a numerous eyes of varying sizes arranged on the front of their head area (cephalothorax). 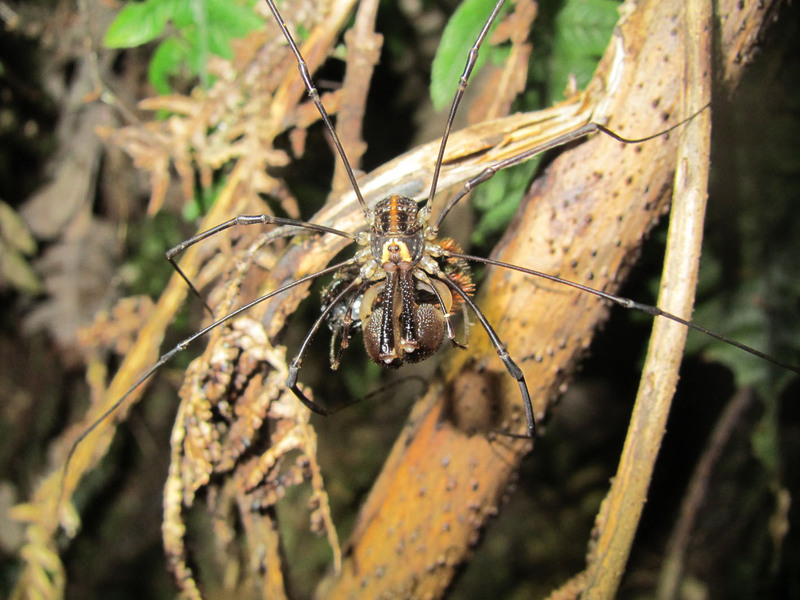 One of the most striking aspects of the long-legged harvestmen in New Zealand are their hugely enlarged jaws, called chelicerae, that are held out in front of their bodies and look rather terrifying if you didn’t know that they are completely harmless. There are at least a dozen species within this family in New Zealand, and there is a fascinating array of shapes and sizes of chelicerae among the species. In some species the chelicerae are very long and skinny, while in others they are enormous, bulbous and spiny. All arachnids have chelicerae, and in spiders they house the venom glands used during prey capture. Harvestmen, however, have no venom glands and their chelicerae instead are used to cut up their food into nice little bite-sized pieces that they then gobble up. From experience of handling lots of these creatures, I can tell you that the little pincer structures on the tips of the chelicerae are so small and weak that at worst they can give you a cute little nip. It doesn’t hurt and it certainly won’t harm you. They may look scary but the jaws on these guys are quite harmless…unless you are a (already dead) fly! The use of these chelicerae for food handling is unlikely to explain why they are so huge among NZ harvestmen. Interestingly, in this group it is only the males of each species that have mammoth* chelicerae; females have small, “normal-sized” jaws. This kind of sexual dimorphism is often driven by strong selection on males to evolve structures that allow them to compete with other males, with the ultimate goal to be able to mate with a nearby female. Sexual selection, a special type of natural selection where traits evolve to increase an individual’s ability to get more mating opportunities, works under two main mechanisms: intersexual selection where females choose male mates based on their quality or something that they can provide the female (like feeding or egg-laying sites), or intrasexual selection based on direct competition between males for access to females. When there is an imbalance in the reproductive success among males in a species, say because some males are better at gaining the attention of a female or can secure better resources, then this can drive the evolution of traits that increase the success of those disadvantaged males. The most well-known examples of traits that a male uses to increase its reproductive success are called ornaments. A classic example would be the bright, flashy colours of a peacock’s train that females use to actively choose the best mates. Alternatively, males can bear weapons, such as horns, spines, claws or big teeth that allow them to physically battle with other males. When the disparity in reproductive success between males is really large this can lead to intense competition, which in turn drives strong selection for ever increasingly large weapons that allow males to win fights and more mating opportunities. Scientists have been fascinated with the evolution of exaggerated traits for decades, and we know a lot about the costs and benefits of ornaments and weapons to the males that bear them. However, we still don’t really understand why there is so much diversity in the function and morphology of weapons. 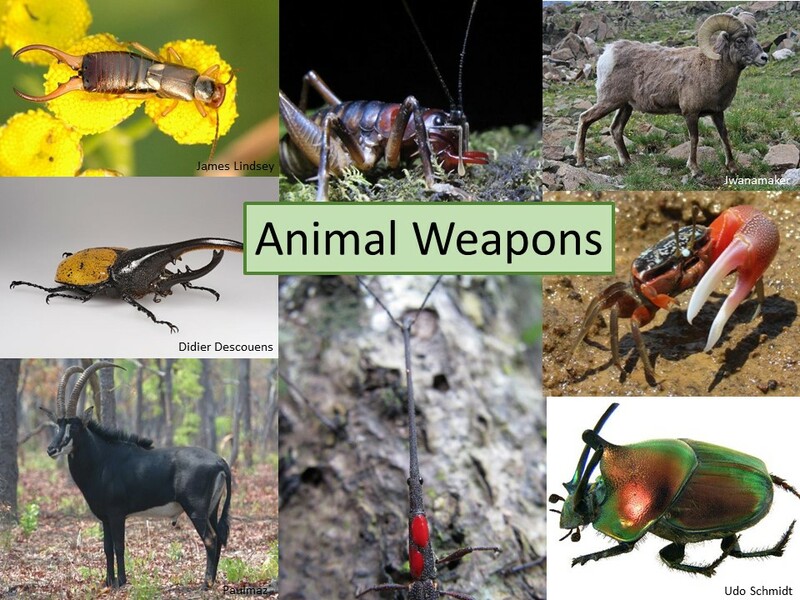 In a symposium on animal weapons and competitive assessment** that I recently co-organised at the Behaviour 2015 conference in Cairns, I noticed that although researchers from around the world are working on very different animal systems, we seem to be collectively in awe of the sheer diversity of weaponry (their shape, size, number and presence) both within and among the species we like most. Particularly for groups of closely related species we might expect to see similar adaptations for weaponry because there should be some ideal form that the structure takes that make them ideal for use during fights. However, this is not what we see; even among groups of very closely related species we see an incredible variety of weapons displayed by males, including some species within those groups that don’t have weapons at all. 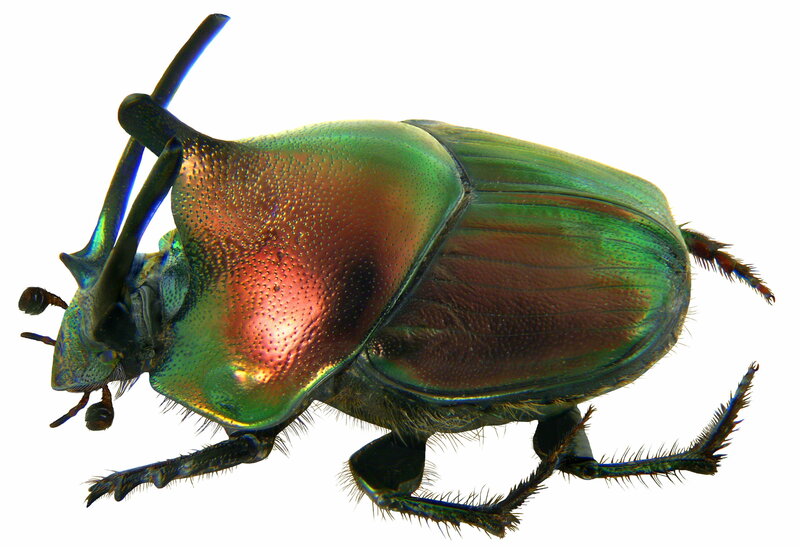 Dung beetles in the genus Onthophagus are perhaps the best group to highlight this pattern. There are several thousand of different species, of which many display enlarged horns used in fights to control access to tunnels under dung pads where females lay their eggs. There is a staggering amount of variation in the way horns are expressed in this group, with some species producing a single horn from different parts of head or thorax, while others are tiny multi-horned little tanks. 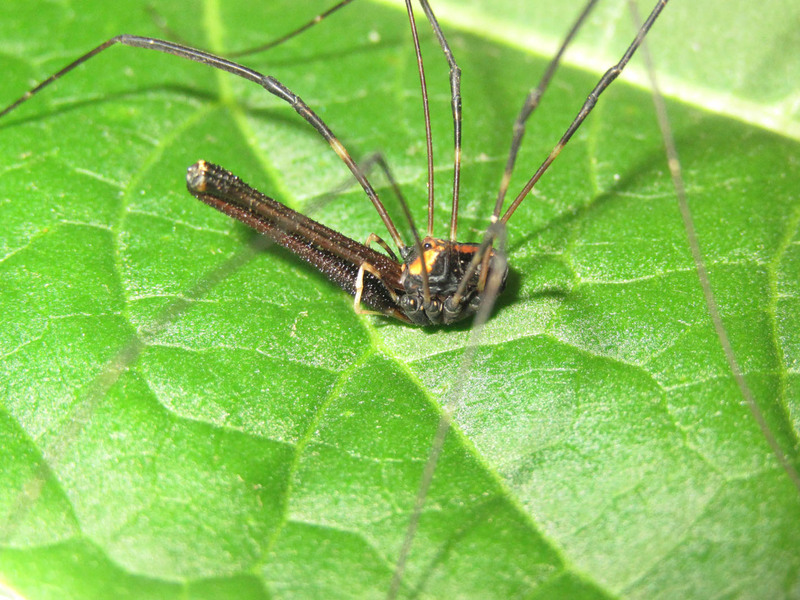 Our observations on one species of harvestmen, Pantopsalis cheliferoides, suggest that the main driver of big male chelicerae is through sexual selection, which we discuss in our latest paper out this week in Scientific Reports. During my postdoc with Greg Holwell we set out, with honours students Anna Probert and Daniel Townsend, to gain some basic observational data to confirm our hypothesis that males are using their chelicerae as weapons. In the lab we watched males fighting between each other, firstly in a ritualized manner where they unfolded and extended their chelicerae and waved them rapidly in front of their rival. In more escalated battles the opponents would clash together and tumble about until one male chose to run away. The most exciting finding from our study though, was that we identified a new type of trimorphism in weapon form. In other animals, it is common to observe huge amounts of variation in size among males, often related to the condition of the individual. 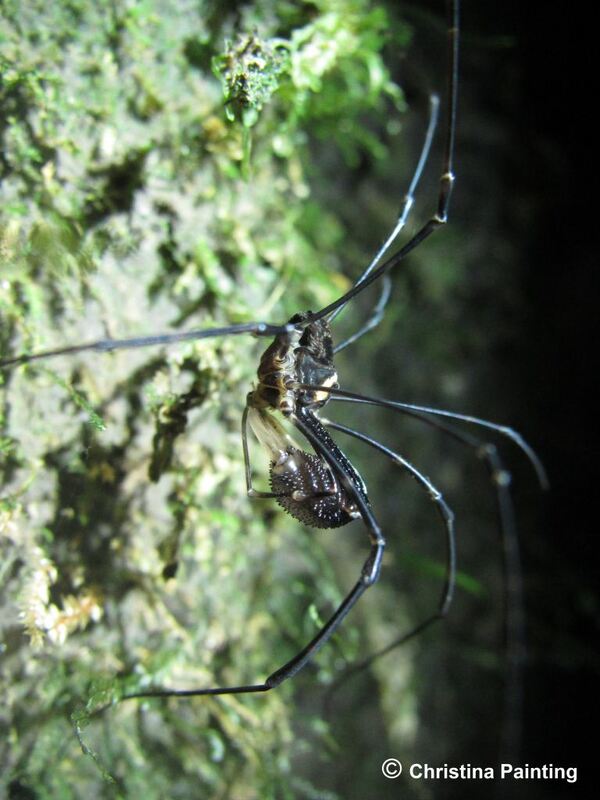 In another species of harvestmen, Serracutisoma proximum, found in south-eastern Brazil, there are two distinct male forms (dimorphism): “majors”, which have big bodies and elongated second legs used in territorial fights, and “minors”, which have smaller bodies, shorter legs, and creep into another male’s territory to mate with his female. Males are assigned to either morph in relation to their body size, a trend seen across many other animal species where males possess big armaments. 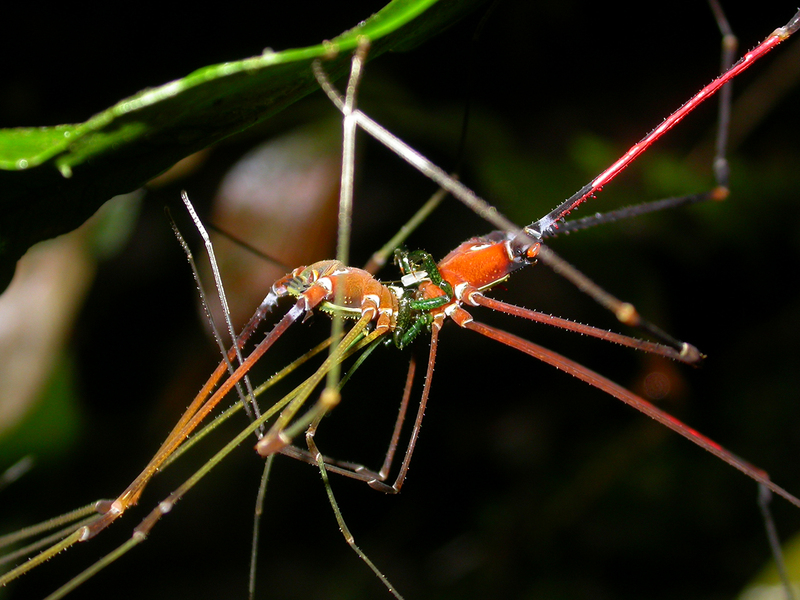 Male dimorphism and the alternative behaviours associated with weapon expression, have been identified in numerous harvestmen species around the world. So, although less well-known than their spider cousins, the harvestmen make excellent model systems for learning more about weapon evolution. Recently researchers working on other invertebrates have found examples of trimorphism in weaponry, meaning that there are three weapon forms, which can be similarly divided up by looking at the relationship between weapon and body size. 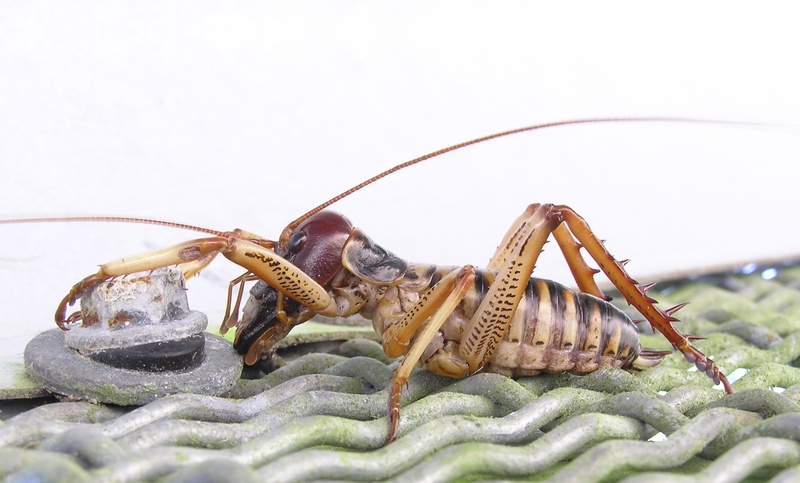 Several species of beetle and weta have been shown to have trimorphic males, but little is known about why this polymorphism has evolved and how the behavioural tactics vary between the different male groups. In all known examples of dimorphism and trimorphism in weapons, however, males are split into armed and unarmed groups in relation to their body size, such that small males typically have small weapons (or none at all) while large males have the exaggerated form. In our current study, we found that body size was associated with weapon size, in that small males had small chelicerae, and large males had large chelicerae. However, using statistical modelling of different measures of weapon size and how this related to body size, we found that big males could display one of two different exaggerated forms. The most common males that we found in the forests around Waitomo had very long, thin chelicerae that were more than 8 times longer than their bodies are wide. A second morph was smaller in body size with correspondingly small but long chelicerae. Amazingly, we also found a third, rarer subset of males that were large in body size, but displayed short, broad chelicerae. Although shorter in length, these chelicerae are still highly exaggerated, but have enlarged in the opposite direction than the males with long, slender chelicerae. This finding is really fascinating, because we don’t know of any other examples of multiple exaggerated weapon forms within a single species. In all other armed species, males can be divided into a group of males with enlarged weapons and another group of males that lack weapons altogether or have a much reduced form. Our early behavioural observations suggest that the shape of the chelicerae may correspond to different fighting tactics, but we have a lot to learn about the relative advantages of being a male with long slender versus short broad weapons. Now that we have the funding to extend this study, I’m really looking forward to being able to explore more about this unique form of trimorphism and what it might be able to tell us about how weapons diverge. While we know from numerous studies on a diverse range of animals that bigger males with increasingly big weapons win fights, we don’t know the role of shape in battle performance. As nicely shown by our group of long-legged harvestmen in NZ, there is often incredible variation in weapon shape among different species. The within-species variation in weapon shape shown by Pantopsalis cheliferoides, however, gives us an invaluable opportunity to figure out the role of weapon shape and how this might lead to divergence. * Interestingly, Doug Emlen, an expert on animal weapons, says that although mammoth tusks were undeniably huge, they only made up about 6% of the animal’s body mass. The chelicerae in the harvestmen that we are working on make up about 50% of a male’s body weight, making these weapons some of the most extreme in the animal kingdom! ** On a side note, at the Behaviour 2015 conference it was also really neat to see how many people are now using Twitter to swap stories about the talks and posters they attend. Actually, when I was a bit bored between experiments I counted them and there were 95 tweets about the weapon and contest symposium! You can check out all the tweets from the conference at #behave15. Painting et al 2015. 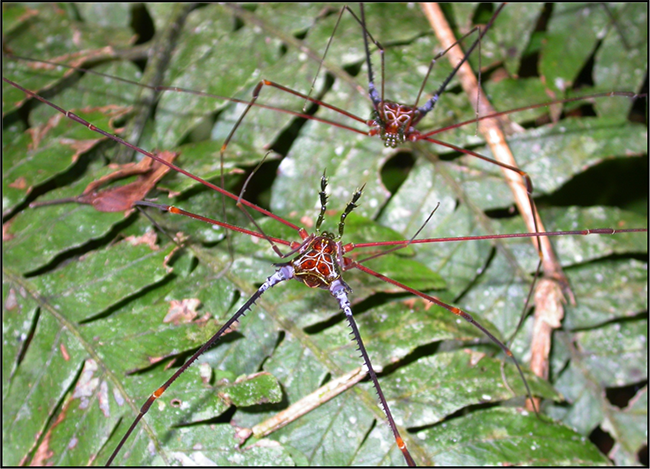 Multiple exaggerated weapon morphs: a novel form of male polymorphism in harvestmen. Scientific Reports. 5, 16368; doi: 10.1038/srep16368. If you are interested in weapons you should read Doug Emlen’s new book “Animal Weapons: The Evolution of Battle“. In the book Doug explains the prerequisite conditions that lead to the evolution of weaponry. As well as many careful and detailed explanations about the theoretical aspects of weapon evolution, supported by wonderful examples of armed animals from around the world, Doug also throws in lots of great anecdotes from his adventures as a biologist, including stories of his time as a graduate student which saw him picking through howler monkey dung in search of tiny horned dung beetles. And because I often feel that the minibeasts of the world tend to get neglected in documentaries and public media, I appreciated that Doug showcased lots of examples of weaponry in insects and other invertebrates. It’s a fabulous book written for anyone with an interest in biology and I can highly recommend it.